Great Wall of China, Is It Really Great? Home » Blog » Great Wall of China, Is It Really Great? Posted on 09/09/2018 at 02:26. Visiting the Great Wall of China is a customary part of visiting Beijing. Parts of the Wall like Mutianyu, Huanghuacheng are just a 1.5- 2-hours car drive away from the airport. Now the big question is, is the Great Wall of China really great? The short answer is definitely yes. But what exactly makes the wall so special? Herein we will explore some of the things that make the Great Wall of China a captivating monument to visit. 1. Its Massive, Sheer Length. At 13,000 miles and traversing forests, mountains, and China’s northern desert, the Great Wall of China is massive. To put its length into perspective, its length is approximately equal to the distance you would cover traveling from New York to Los Angeles, four times. Even the distance from Beijing to Los Angeles is not enough to equate the length of the Great Wall of China. 2. It Took Centuries to Build. The total build time for the entire wall was more than 2,000 years. The project extended over multiple imperial kingdoms and dynasties, with the final builds of the wall being constructed between 1368 and 1644 by the Ming Dynasty. In fact, during its construction, some eroded sections of the wall had to be rebuilt quite frequently. There are very few engineering projects, if any, that can compare to the Great Wall. 3. An Enormous Amount of People Made Sacrifices in its Construction. The Great Wall too more than sheer will, great wisdom, and enormous effort to build. It took a great deal of sacrifice as well. Historians estimate that in excess of a million Chinese lost their lives while building of the Great Wall. Workers included peasants and soldier who were recruited to provide labor for its construction. 4. It is a Major Tourist Attraction. After its completion in 1644 by the Ming Dynasty, the wall was converted from a military installation to a tourism attraction. It has become a major tourist attraction, with over 10 million people visiting the Great Wall every year. The Great Wall-Badaling is the most visited part of the wall. This 45-miles section is highly restored, and, importantly, it is accessible to seniors. Its reconstruction and restoration began in 195. During the months of May and October, over 70,000 people visit the Badaling Wall on a daily basis. The Mutianyu section of the wall is another popular section. 5. A Wall of Extremes. The tallest sections of the Great Wall reach approximately 25 feet high. The wall has a width of between 25 to 35 feet. In the Heita Mountain, Beijing, the wall has an altitude of over 5,000 feet and at Laolongtou, at the sea level, it has the lowest altitude. 6. Made of a Little of This and a Little of That. 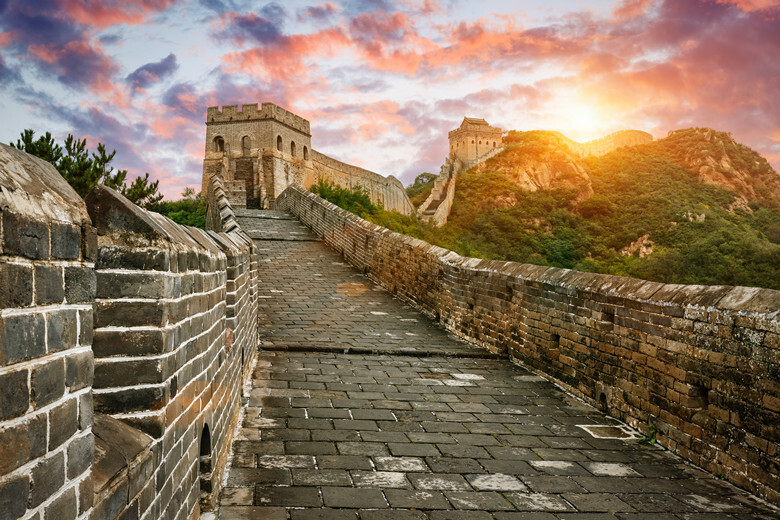 The Great Wall is made using brick, stone, mud, and wood. Rice flour was used as a binding agent for the bricks during the Qin Dynasty in 221 to 205 BC.